Myspace has always been a social networking site focused on music, however in its earlier days other people were able to create their own profiles and really enjoy creating their own individual online presence. I remember studying rudimentary skills about HTML coding and being thrilled when I could make small changes to my profile. Below is what profiles used to look like. You could add colors, music, photos, and different pictures that you chose to describe yourself. Its all gone now. All of your messages, blogs, posts, your entire profile besides your location, top friends and pictures are gone. However, it seems as though they are working on getting you your content back, some questions are answered here, but a lot still aren’t, causing distress for people who lost their content and blogs. Now, however, it is back to putting its focus on music and social networking surrounding music artists and people reaching out and branding their own bands. You can update a status to let people know what is going on as well as see who would be a good connection for you. You can link your updates to Facebook and Twitter which is a good reminder that this site is a social networking site. Even though it is highly geared to the music genre, it gives people the ability to connect. To test the new layout, I created my own portfolio. I looked for music, albums, and songs that interested me in order to figure out what I could display. There are a lot of options, of course I am very mainstream so I chose things that were easy to find, but you can create your own photos and upload those as well if you wanted a more personalized portfolio look. So where did Myspace begin? Myspace was founded in 2003 after the four founders Chris DeWolfe, Brad Greenspan, Tom Anderson and Josh Berman saw potential in the Friendster concept and pushing it forward in their own way. By 2005 Rupert Murdoch’s News Corp. buys Intermix Media for $580 million. At the time Myspace’s value in the deal was around $327 million. People thought that there was no where to go but up when it came to Myspace’s growth and profitability. By July 2006 Myspace had become the most popular site visited in the US. What does that mean when it comes to numbers? Looking at the graph above you can see how Myspace was far ahead of Facebook in popularity until about 2009. In 2009 it still beat Facebook when it came to people aged 24 or under. However after all the scandal that had started to occur in 2006 and continued to happen you see a sharp decline after Facebook allows more people to create profiles. You can’t learn about Myspace without talking about the various high profile scandals that happened from 2006 on. There were sexual predators, suicides brought on by bullying messages and more. Part of the reason people switched from Myspace to Facebook was that the public perception kept getting worse as more scandals grew. So what happened next? In January 2011 Myspace laid off 47% of employees. After the lay off, Rupert Murdoch sold the company for $35 million, 6% of what he paid for it in 2005. However, the question is where are they now? In June 2013, Justin Timberlake announced that he has become a co-owner of the “new MySpace”. As of October 1, 2013, Myspace now has 36 million users, this is up from a report of 24 million prior to the relaunch. For someone who is interested in music this is a great site, also people who truly want to connect with bands and artists this is a great way to reach out and be heard. Since there is a lot less traffic when compared to Twitter or Facebook, when you make a comment there is a higher likelihood that it will be seen. On Top Ten Reviews, they ranked it an 8.28 our of 10. For someone who is interested in music, or in getting their music heard, I think this is an appropriate site for people to connect. 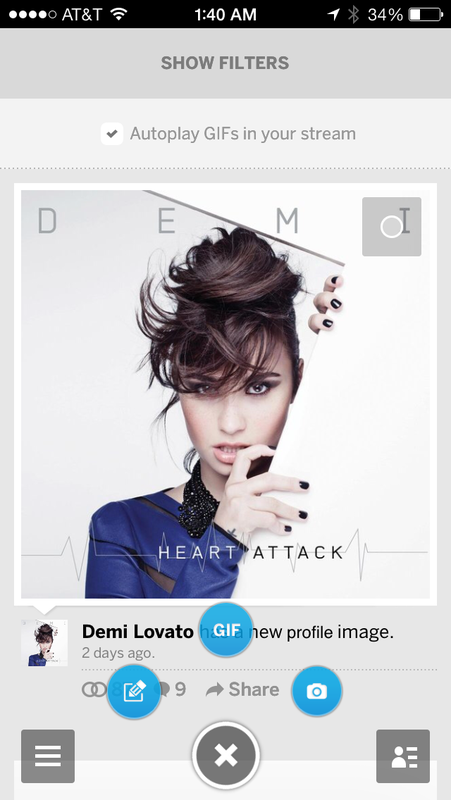 You can use Myspace on the go with their mobile app. 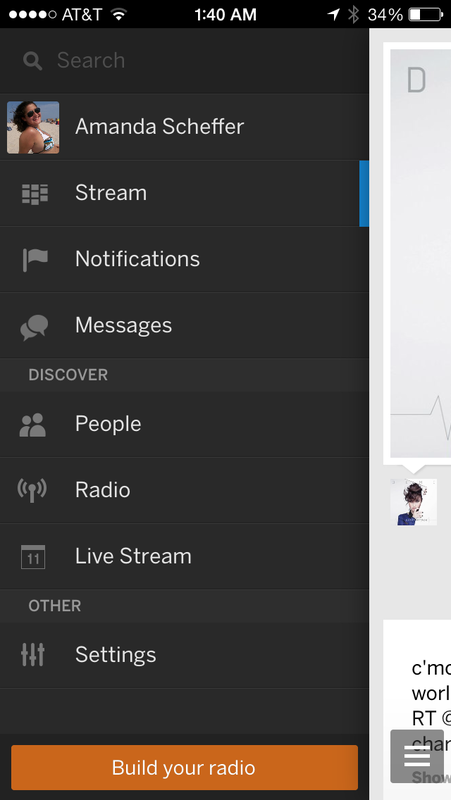 You can receive updates and notifications on the go, as well as check the live stream to see what is happening. There is a possibility to upload photos as well as videos. It is a really easy to use application that makes it easy to stay constantly connected. This is a great way for a musician or artist to reach out and grow their own influence. However, it is not all good. The formatting of the website itself has changed, which ends up being really confusing and makes using the mobile app a much easier option. The website has a format where you have to swipe to the side to see updates and read articles. Sometimes this leads to having to deal with awkward layouts and having to continuously swipe back and forth in order to read the article in full. Here is an example on an article about Miley Cyrus. There are a lot of featured articles about various artists although you do have to scroll side to side in order to see all the options. Truthfully, if you are not interested in connecting with music artists or staying on top of the music industry, I would still recommend taking a look at Myspace anyway. If you do nothing else, you can take a look at your own photos and make sure that there is nothing embarrassing that comes up under your name. No matter how old your profile is, it is always a good idea to know what is out there. If you are an artist or musician who is interested in connecting with other artists, this is the site for you. It may be hard to navigate, but the fact that you can grow your influence at such a greater pace due to the current less popular nature of this site, it is a great time to log in and work on your profile. For more information about the New Myspace, take a look at my Prezi. Stenovec, Timothy. “Myspace History: A Timeline Of The Social Network’s Biggest Moments.” The Huffington Post. TheHuffingtonPost.com, 29 June 2011. Web. 3 Oct. 2013. <http://www.huffingtonpost.com/2011/06/29/myspace-history-timeline_n_887059.html>. 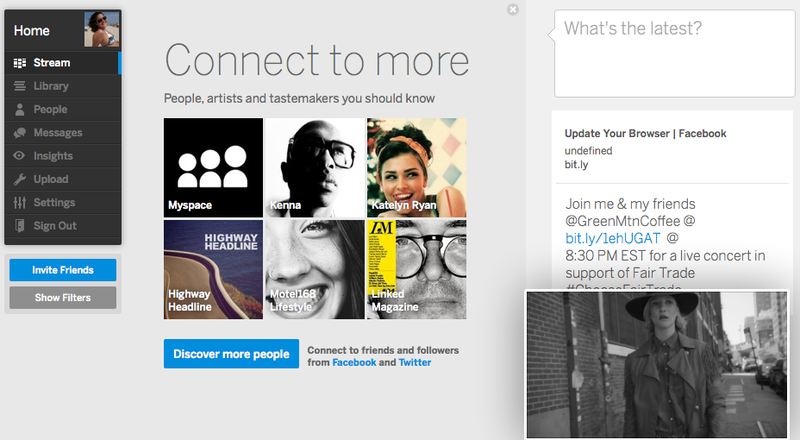 “Accessing Old Content.” – Ask Myspace. Myspace, n.d. Web. 6 Oct. 2013. <https://www.askmyspace.com/t5/Reviewed-Feedback/Accessing-old-content/td-p/46379>. 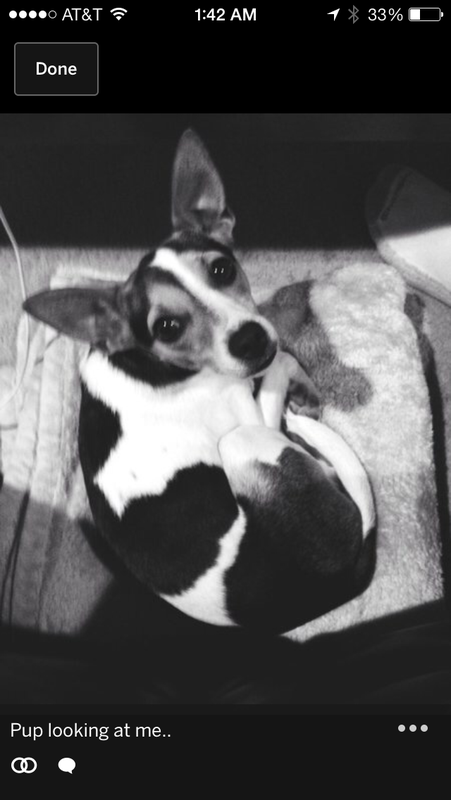 Cashmore, Pete. “Mashable.” Mashable. N.p., 11 July 2006. Web. 10 Oct. 2013. <http://mashable.com/2006/07/11/myspace-americas-number-one/>. Nakashima, Ryan. “Myspace Layoffs: 47 Percent Of Staff Fired.” The Huffington Post. TheHuffingtonPost.com, 11 Jan. 2011. Web. 11 Oct. 2013. <http://www.huffingtonpost.com/2011/01/11/myspace-layoffs-2011_n_807421.html>. Jackson, Nicholas. “As MySpace Sells for $35 Million, a History of the Network’s Valuation.” The Atlantic. N.p., 29 June 2011. Web. 11 Oct. 2013. <http://www.theatlantic.com/technology/archive/2011/06/as-myspace-sells-for-35-million-a-history-of-the-networks-valuation/241224/>. “Bringing MySpace Back: Justin Timberlake, Partners Introduce Revamped Site with Musical Focus.” ABC15 Taking Action. N.p., 13 June 2013. Web. 11 Oct. 2013. <http://www.abc15.com/dpp/news/science_tech/bringing-myspace-back-justin-timberlake-partners-introduce-revamped-site-with-musical-focus>. “Myspace Top Ten Reviews.” Myspace 2013. N.p., n.d. Web. 11 Oct. 2013. <http://social-networking-websites-review.toptenreviews.com/myspace-review.html>. McHugh, Molly. “Myspace Now Boasts 36M Users and a 340 Percent Increase in Artists Using the Network.” Digital Trends. N.p., 1 Oct. 2013. Web. 10 Oct. 2013. 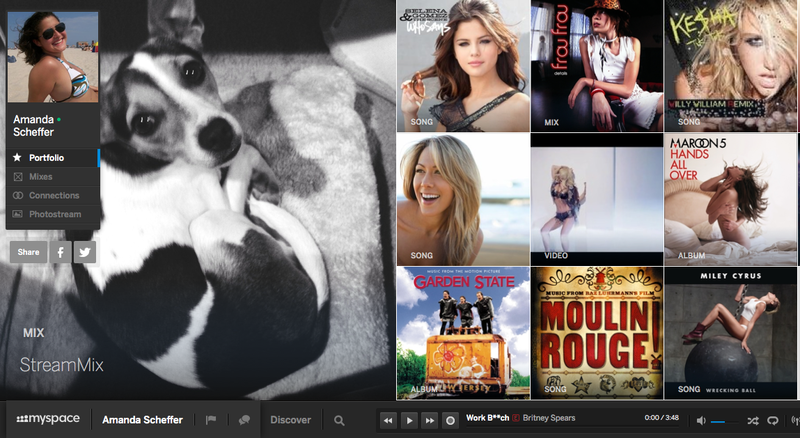 <http://www.digitaltrends.com/social-media/myspace-releases-new-user-numbers/>. Houghton, Bruce. “Hypebot.” ‘hypebot’ Celebrity Access, 2 Oct. 2013. Web. 11 Oct. 2013. <http://www.hypebot.com/hypebot/2013/10/myspace-reports-growth-daily-site-visits-7m-artist-profiles-up-340.html>. “SAVE SMC.” SAVE SMC. Blogger, 18 Mar. 2007. Web. 13 Oct. 2013. 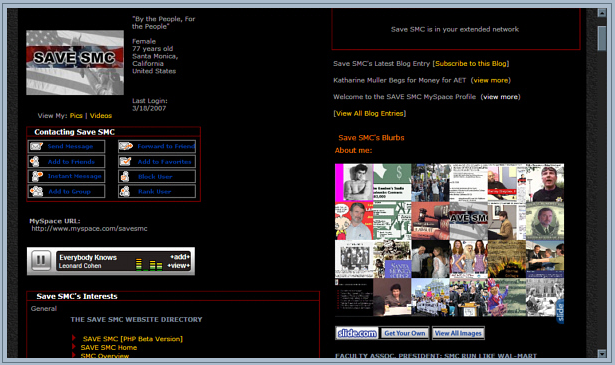 <http://savesmc.blogspot.com/2007/03/official-save-smc-myspace-page-has.html>.